Star Trek has the Enterprise. Star Wars has the Millenium Falcon. Battlestar Galactica has… Battlestar Galactica. Each of these ships fulfills a different purpose and so has a different design. If your work features an important spaceship, then this is something you have to think about. What Is Your Ship’s FTL Propulsion Method? It turns out space is big. Really big. Getting around means you’ll have to massage your way past Einstein’s rule that nothing can go faster than the speed of light. Your ship just pours on the speed, never mind what physics says. Despite the talk of warping space, this is essentially the Star Trek method. While the ship accelerates to well past the speed of light, it never leaves normal space. 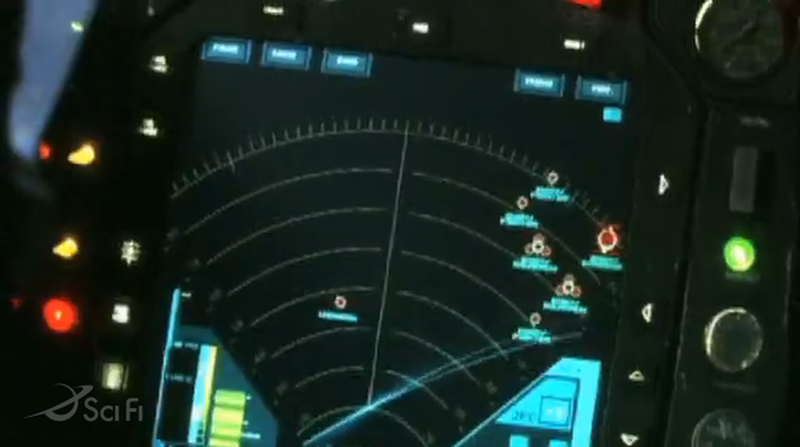 It can still scan the area ahead,* so it won’t be taken by surprise if there’s a hostile fleet lying in wait. Another consequence is that going FTL is only an escape if you’re faster than the other guy. They can still track you after you’ve kicked it up to full throttle. Since this universe won’t let us go FTL, let’s go to another one. This is the hyperspace of Star Wars and Babylon Five (B5). Exiting our universe completely, these ships tunnel through their own personal dimension to get where they need to go. Usually, this means that activating the ship’s FTL drive makes it safe from attack. There can be exceptions, but jumping to hyperspace will usually be a moment of relief. Because it’s such a powerful way to get out of trouble, there should be limits on when it can be used. In Star Wars, ships can’t go into hyperspace within a planet’s gravity well. In B5, it requires specially constructed gates for all but the largest ships. Even more extreme than the pocket dimension, there’s no travel time at all with this method. The ship simply disappears from one place and reappears in another. 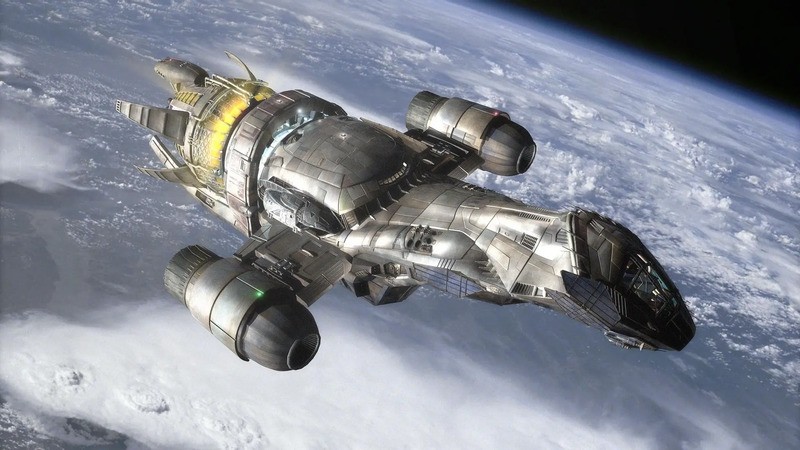 It’s most famously seen on Battlestar Galactica (BSG), but it appears in other stories as well, such as the Solar Clipper series by Nathan Lowell. Ships with this form of propulsion can travel truly massive distances. Even if the jumps they make are relatively short, the only limiting factor is how quickly they can recharge for another one. This means that ships can easily escape any kind of trouble so long as their engines are working. BSG limits this with time consuming FTL equations and a delay as the ship drives spool* up. As a side benefit, a teleportation drive means that ships often end up nose to nose, rather than millions of miles apart. It turns out that the speed of light is a difficult speed limit to break, and authors looking for a more science-friendly story often stay below it. Your ship can still go plenty fast with sublight engines, fast enough to make interplanetary travel a breeze. You’ll be limited to one solar system, sure, but look how much there is to explore right in our own backyard. Limiting your ship to sublight speed will make it more realistic, and allow you to engage in nitty gritty science fiction. How Does Your Ship Move at Sublight? No matter what your FTL method is (if you have one), your ship will still need to get around in normal space. How you do this will have a big influence on the level of your setting’s technology, not just how you get from place to place. This is the current method for navigating our solar system. 21st century spacecraft have very limited fuel, so they have to plan nearly every bit of thrust, leaving nothing to chance. The course that Rosetta took to rendezvous with the comet 67P, for example, is incredibly complicated, and full of complex math. When Apollo 13 suffered a damaging explosion, they couldn’t just turn around and fly back to Earth. They had to keep going on the course they’d committed to. Using this method will make fuel management an active part of your story. The characters won’t be able to go wherever they please; they’ll have to be constantly watching their tanks. It’s very limiting, but the good news is that because this is how real spaceships work, there’s plenty of reference material. This is hard scifi at its finest. A variant is to use engines that have extremely long-lasting fuel sources but produce little acceleration. Ion engines fit the bill nicely. Ships can get going at a good clip with a long enough burn, but deviating from their course will be very difficult because of how long it takes to build up thrust. This is the standard for the vast majority of space-going scifi settings. The ship employs some kind of extremely efficient reaction drives to push it where it needs to go. When Captain Picard orders his ship into orbit of a new M-class planet, he’s not worried about running out of gas before they get there. Even in Firefly, when Mal does occasionally fret about running out of fuel, it’s understood that this isn’t a problem for better funded ships. When in doubt, this is the option to go with. It’s tried and true, letting you explore your setting without much fuss. Practically, this method of propulsion has some caveats to consider. Ships will be slower further from the sun,* and going toward the sun will be more difficult than going away. The sail itself is also important. It would be huge and no doubt prone to damage. This is your chance to get an astronaut swinging through the rigging to repair meteorite impacts! The inside of your ship is at least as important as the outside. Do your characters feel at home within its hull, or is each day a strain on their nerves? If you ever take a look at the International Space Station, you’ll notice that it’s incredibly crowded. There’s stuff floating everywhere because space is at a premium. This is the look you go with if you want your ship as close to modern technology as possible. There probably wouldn’t be artificial gravity. The food would mostly be slurped from bags. Using the bathroom would be… complicated. This is the kind of ship one has to be very dedicated to serve on. It lends itself to explorers making the first push to Mars or maybe homegrown space enthusiasts cobbling together their own ship form whatever is lying around. Characters on this kind of ship are most likely military or maybe high-level corporate types. They’re here to do a job. That won’t be the only aspect of their characters, but it will be ever-present. They’ll all be part of something bigger than themselves, whether they want to or not. Welcome aboard either Serenity or the Millenium Falcon. These ships are homes as well as machines. Even if the characters don’t necessarily want to be on board, the ship’s environment will have a calming effect. This works on the audience as well, if you do it right. They will start to feel comfortable with the ship, like slipping on an old sweater. They’ll react viscerally if the ship is threatened by intruders. Use this to set up poignant stories. This kind of ship is often independently owned but not always. 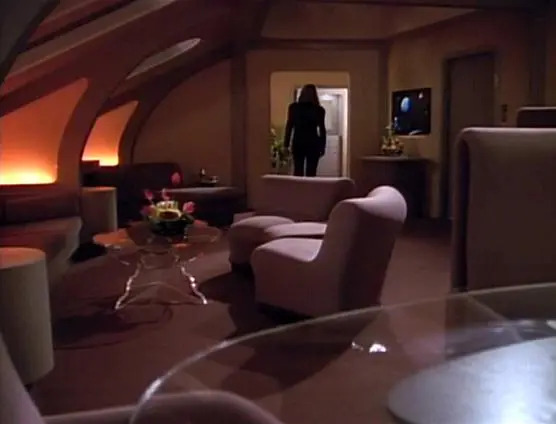 Star Trek’s Deep Space Nine space station fits the bill, as does Babylon Five. It’s a place where people live as well as work, and they can’t help but leave their mark. There’s nothing wrong with that, but it can make your characters harder to identify with. Drama loses some of its edge if the characters can return home to their cabins and order a three course meal while getting a deep tissue massage. How Good Are Its Sensors? Unless you’re in very old science fiction, your ship’s going to need more than the mark one eyeball to see with. Looking out the window just won’t cut it in the cold vacuum. This level of technology is pretty close to what we have today. Sensors will tell you that something’s out there and maybe its mass, but that’s it. Unless the mystery object is broadcasting a signal, you won’t know anything about it. This is great for building tension and suspense. What’s that blip out there? It’s getting closer. Should we open fire? The downside is that it’s a very involved method. Your characters can never just know what’s going on with another ship. They’ll always have to question their information, and the audience will want to know how they learned it. The next step up are sensors that give you about the same information as a visual examination of whatever’s being scanned. You can tell that little blip is a TIE fighter, that it has Imperial markings, but not that it’s carrying Lord Vader. This method provides a decent balance, allowing you to easily describe what’s happening around your ship without giving too much information to the audience. It works particularly well for a setting like Star Wars, in which the space battles are clearly analogous to historical naval combat when visual range encounters were common. Star Trek sensors can tell you what an approaching ship is made of, how many people are on board, and how many of them own cats. There is seemingly no end to the pinpoint information these scanners can produce from remarkably far away. This is another case of wowing your audience with the wonders of the future. It also allows you to put on dazzling displays of description as the characters learn absolutely everything about what they’re looking at. Of course, you have to be good at description in order for that to work. The drawback to having such powerful sensors is that sometimes drama depends on the characters not having certain information. Many an episode of Trek features the previously all-seeing scanners inexplicably not noticing that a hostile ship was charging weapons. You can sometimes explain this by saying there’s some kind of interference or another, but that excuse will get tired if you aren’t careful. Space battles are an ever-present element of science fiction, and chances are if there’s a ship in your story, it will eventually be attacked. How does it defend itself? Or, if its crew is a bit more proactive, how does it attack other ships? 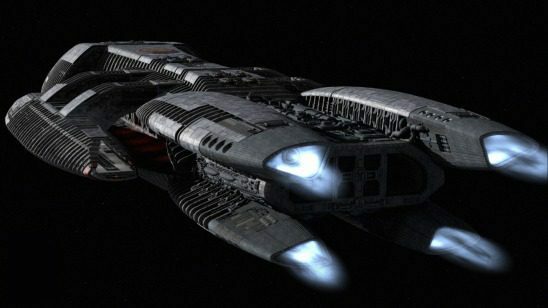 One of the novel things about Firefly was that, as Jayne so eloquently put it, “A transport ship ain’t got no guns on it.” Serenity was completely unarmed, which made things interesting when it ran into hostile vessels that weren’t. If your ship has no weapons, your characters will have to be more inventive. They can’t just blow the attacking space pirates out of the sky. They have to run and hide or cobble some kind of weapon together. It limits your options, but it can be engaging. Whether it’s a simple laser or something more complicated, this is a beam of energy projected across space at the speed of light. It has very long range. It’s precise and accurate. If you can see something, you can hit it with this weapon. Space battles with such a weapon will be short, as there isn’t a lot of maneuvering to be done when incoming fire is moving at the speed of light. This is good news if you’re in a visual medium with a limited budget, but perhaps bad news if you want to film the Battle of Britain in Space. Early Star Trek used this kind of weapon a lot, before Deep Space Nine (DS9) took things in a more WWII type direction. These are any weapons that operate more or less the way modern firearms do. BSG has actual space guns – that is, shells propelled by explosive chemicals. Star Wars has space guns disguised as directed energy weapons. They call them lasers or blasters, but they clearly operate more like battleship cannons. The biggest advantage to this style of weaponry is that building dramatic space battles is easy. You just take your inspiration from historical naval battles, especially WWII. You can have giant capital ships slugging it out broadside to broadside while fighters dogfight around them. The downside is that you aren’t taking full advantage of being in space. Space is a completely alien environment, and it’s limiting to focus exclusively on how battles used to be fought. As mentioned, space is really big. Your ships will often be so far apart that light will take several minutes to cross the gulf between them. At that range, even a laser is useless. Instead, your ship could use guided, self propelled projectiles that can travel to the target and adjust their course to ensure a hit. This type of weaponry is seen in the Honor Harrington series, where it introduces a completely different dynamic to space combat. Battles become tense waiting games as enemy missiles come burning in. The fire-and-forget nature of these weapons means that once they are launched, the characters can only watch and hope for a hit. The main action of combat focuses around using countermeasures against incoming fire. It requires a different mindset than the more fast paced battles with space guns, but it has an appeal all its own. 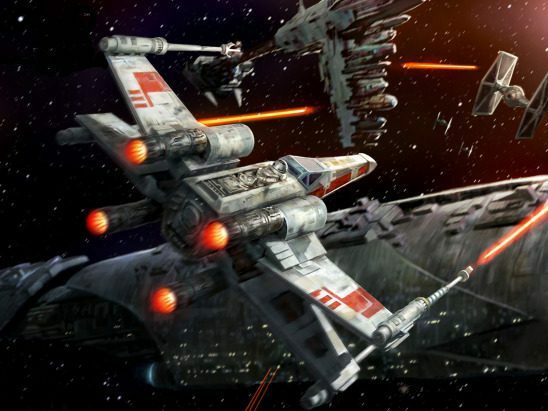 From X-Wings to Vipers to Star Furies, fighters are a mainstay of space combat. If your ship is big enough, it may fight primarily by launching smaller craft to attack the enemy. This allows for some excellent drama. Dogfights between fighters are perfect for moments of individual heroism, and fighter pilots will always be popular as main characters. Plus, removing your characters from the safety of their mothership is a great way to ratchet up the danger. Of course, this method isn’t always practical. You need a ship big enough to carry fighters, for one thing. For another, space fighters aren’t terribly realistic. Targeting systems would probably be too accurate for dodging and weaving to be an effective defense. Fighters also imply your ship is purpose-built for combat, which won’t work in many stories. Chances are very good that your ship will use some combination of the above options. Galactica has both fighters and space guns. The Enterprise has directed energy weapons with its phasers, while photon torpedoes are much more like missiles. The key is to remember what each kind of weapon means for your story. How Do Characters Get Off It? No matter how cool your spaceship is, eventually the characters will have to leave it. How do they do that? If your spaceship is on the smaller side, it may let people off directly, whether that means landing on a planet’s surface or docking with a space station. Larger ships can do this as well, but it starts to get impractical, especially with landing. Having this be your ship’s primary means of egress puts a major limit on your characters’ freedom of movement. They can only go where the ship goes. 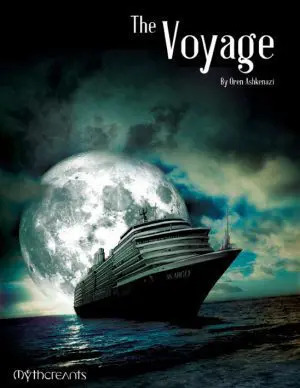 It also means that if the ship is damaged, getting off it will be more difficult, which is great for drama. The most practical method, especially for larger vessels, this means your ship carries a number of smaller craft that are fully functional spaceships in their own right. They have a limited range of course, but they’ll get you to the ground and back. This increases your characters’ freedom of movement, allowing some to visit the big city while others explore mysterious alien ruins. It also opens the possibility of a story with one or more characters trapped and isolated on a damaged shuttle. The important thing to remember is that the ship breaking doesn’t mean the shuttles are broken. If the ship has a power failure, the audience will immediately ask why the characters don’t divert power from the independent shuttle engines. 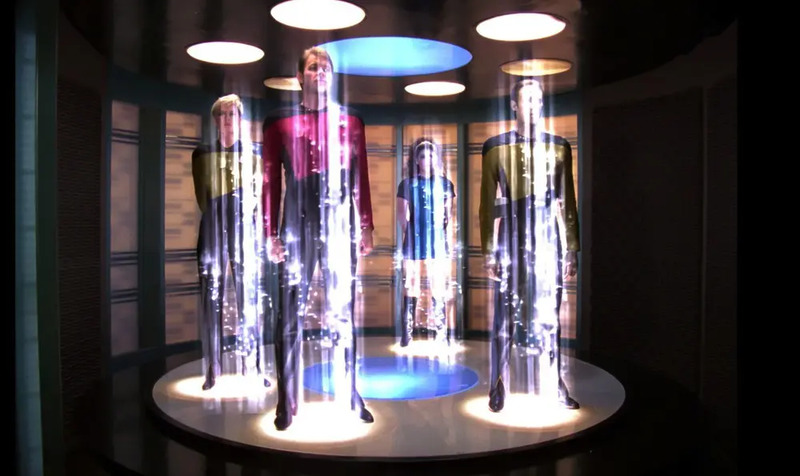 While transporters were originally a way for Gene Roddenberry to save money on landing sequences, they have since carved out a place for themselves in science fiction. These are devices that move a character from one place to another instantaneously. They can work via matter energy conversion, micro-wormholes, or anything else that sounds reasonably scientific. They offer unparalleled freedom of movement, getting your characters into places they’d have no other way of reaching. You no longer have to spend time on travel sequences or explain how the characters arrived so quickly. The drawback is that sometimes you’ll have stories that only work if your characters can’t get somewhere. Teleportation is such a powerful way of getting around that you may have trouble writing it properly. If you’re going to use this method, establish early what can and can’t be teleported through, and then stick with it. In this last section, we consider your ship’s physical appearance. We’re looking at broad strokes rather than specific details. Decide on the shape and paint job once you’ve considered some broader themes. As seen with Serenity, the Millenium Falcon, and every other independent trading vessel ever featured in a science fiction story. This is the look of the underdog. It’s a scrappy ship that’s got heart. In other words, something we will always root for. It’s great for communicating how outmatched and poorly equipped the main characters are, which is something the audience will love. This ship means business. If it’s not bristling with weapons, it’s some kind of mega cargo carrier that can fit a dozen lesser ships inside it. This look projects power. It is imposing, and communicates a level of seriousness to your story. You don’t want to use this look for a lighthearted romp through the solar system, but it’s perfect for an epic war with evil robots. Note that the ship doesn’t actually have to be large. DS9’s Defiant is a small ship, but it’s definitely Big and Mean. The true ship of the future, a triumph of technology and engineering. This ship will dazzle the audience with all its swanky design features. 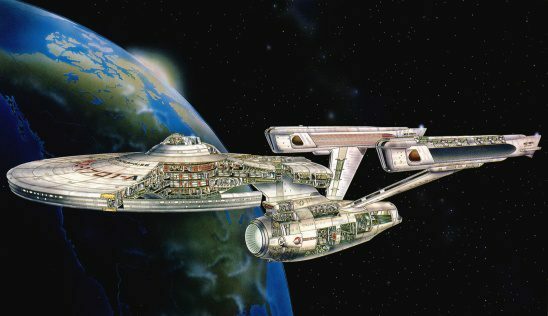 Pair this with a Hotel in Space look for the interior, and you have the Enterprise D. Ships like this work best in optimistic settings, where they portray the awesome heights humanity can achieve. Your protagonist may come off as something of a tool if they’re flying one of these in a gritty, realistic setting where people have to scrounge for survival. By now you should have a pretty good idea what your spaceship is like, at least in terms of the big picture. The rest can be added as you go. These steps will get you a skeleton, but you’ll still have to fill in the rest. How comfortable is the captain’s chair? What kind of noise do the engines make? These smaller scale questions should be addressed as they come up, but now you have a solid foundation to base them on. Apparently, their sensors can also go FTL. This is probably just a saying. It doesn’t seem like anything in BSG actually spools. No word yet if there’s a plank to walk. Although apparently they can push themselves with an on-board laser. If you’re familiar with The Night’s Dawn trilogy you might make an addendum to the combat section’s ‘Missile’ entry – or perhaps make a new entry – for drones. Proxies other than starfighters called combat wasps play a large role in the space combat in ND. They are automated defense and attack machines loaded with nuclear fuel stores and various munitions and countermeasures: solid-state projectiles, laser/maser cannons, as well as explosives, sensor bafflers, and electromagnetic offensive/defensive suites. They make space combat a sort of wager between ships; who commits more (or better equipped) wasps to the fray often wins the field, barring a lucky penetration of defenses by the outnumbered or undergunned. Fire-and-forget weaponry somewhere between a missile and a starfighter, I don’t know where to exactly class these armaments myself in your article. They maneuver, fire their own weapons, engage with one another and evade destruction like a starfighter; they track targets, accelerate towards them with the aim of delivering a payload like a missile. I haven’t read that series, but I have speculated on space drones before, back in my Problems with Space Battles article as I recall. It’s certainly an interesting concept, and frankly the most likely way space battles will actually happen (if they happen at all. I’m still hopeful). It does kind of raise the question of why the entire space combat operation, from drones to mother ships, it’s automated. Likely an issue with trusting A.I. Can’t hack a human (maybe you could, by then?) but you can definitely tell a smart car to swerve into oncoming traffic, or perhaps the risk of AGI revolt is too high? Maybe it’s that all-too-human pride, the same thing that’ll keep automated cars in limbo for longer than they should be, or that will convince us we can perform surgery in thirty years when machines do it faster, safer, more elegantly. Who can say? The video game series Mass Effect has an interesting setup for space travel. Ships have some sort of FTL drive, though whether it’s hyperspace or just going really fast isn’t specified to my knowledge. These drives are just for going between systems, though – to navigate between clusters of systems and move across the galaxy, ships use mass relays. The technobabble is that they change an object’s mass in order to fling it across space to the next relay. In practical terms, this is like putting your car on a train – it allows you to go longer distances but between specific points; you board at the closest “stop” and take the train (relay) to one near your destination, then unload your car (ship) and use its own power to go the rest of the way. This becomes relavent plot-wise because certain relays are required to get to particular destinations. In the first game, you discover a previously unknown relay to an ancient world. In the second, a relay is the only way to get to the enemy base, but you need specific code to target the relay correctly (a margin of error means the difference between arriving at the base and arriving in a black hole). And finally, in the third game, civilization-destroying war machines arrive, and them controlling a system’s relay means they control the system. The stealth system on the protagonist’s ship means they can sneak by, but if you use the scanners at all the machines take notice – another aspect of ship-related tech that’s often overlooked (you scan them, they’ll see you). A funny thing about Mass Effect’s FTL drives is that they just use their regular engines to fly at sublight speeds. After creating a Mass Effect field around them to make the local lightspeed way above C, that is. 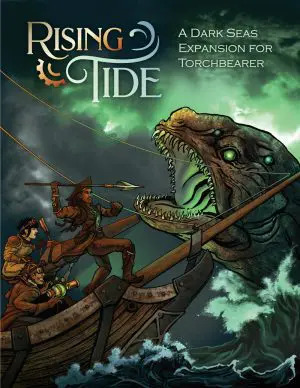 This way, they can travel at a sublight speed that is orders of magnitude higher than C.
Also, a fair amount of these considerations (though perhaps not all the examples) apply to airships in fantasy and/or steampunk stories. One thing to consider in ship design — it doesn’t have to look streamlined unless it enters atmospheres! 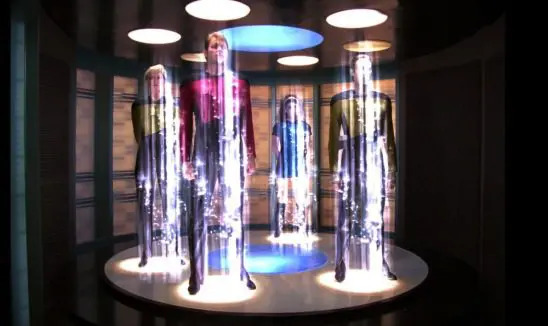 The Borg Cube came about in Star Trek from some NASA folks who complained to Roddenbery about human ships having too much longing for areodynamics. Cones waste a lot of space. If you’re going to enter an atmosphere (Firefly, Falcon), sure, but the Enterprise and Battlestar Galactica hang above planets… they don’t need to look like ships. May I then recommend The Expanse, by James S. A. Corey? Not only are those ships scientifically sound, but they are basically just boxes flying through space. While there is the functionality of shape there is also the emotion of shape, which is where a pleasing, inspiring, or otherwise generally appealing, aesthetic of form might be applied for reasons of pride and morale; and maybe a bit of tradition, too. Though likely of a higher cost to build, the benefits in those areas might well justify writing the check to build the ship that way. Same for external color schemes, liveries, decoration, insignia, whichever term is the correct one. A little story I occasionally play at writing to entertain myself mentions outright that tradition and pride were the reason some craft were decorated they way they were even though out in interstellar void the livery would be invisible 94.327% of the time. Just came here to point out that Apollo 13 would have been able to turn around and fly back towards the earth (That was called a direct abort) the reason it didn’t do that and instead used the moon’s gravitiy to return is that a direct abort would have required to use the SPS engine on the Service Module, which was too risky. I suggest checking the crimson worlds by Jay Allen and Frontier’s Saga by Ryk Brown. Thank you for putting this list together, it is helping me to storyboard my books I am writing. One thing I really like about the Netflix show Voltron: Legendary Defender is the castleship that serves as the primary base of operations for the protagonists. The ship is novel in that it is also the royal castle of the ancient Altean race, and the fact that it is both a castle and a spaceship is certainly new and different. It has a few flaws, such as the apparent lack of need for fuel supply runs, but the overall design of the ship (literally looks like a floating, sci-fi castle) and its dual nature as a battle station and royal palace lends some novelty to this already brilliant show. “Space Usagi” also had sky castles, but they are rare, I give you that. What would be different aout a spaceship for non-planetary life? That would be a good question to post to the Worldbuilding Stack Exchange. https://worldbuilding.stackexchange.com/ I’d guess there might be less consistency about orientation of labels (just assume that users might be viewing from any angle). Maybe more docking hatches (if you don’t have to land in an atmosphere, hatches are less of a risk, and not having to rotate the ship in order to dock would save fuel). More air currents through the ship instead of handholds (a species that assumes it is always “flying”)? Some of this will depend upon the actual biology of the space species. That “consistency about orientation of labels” just had my brain doing that word thing it sometimes does: note the subtle but important difference between designing your spaceship and de-signing your spaceship. Why woul there be air in a spaceship for creatures that don’t need air? Keeping the air in requires energy or material better used for something else. Who says they don’t need air? Just because they aren’t planet-based doesn’t change the need for heat circulation. They might use water or a non-oxygen gas, but any lifeform is almost certainly going to burn up if it isn’t in some sort of heat-exchange fluid OR it is going to need really long arms to radiate heat directly to space, and at that point, it doesn’t have a spaceship… it *is* the spaceship. Well, if it can live in non-planetary space without tools, the small amount of gas floating between planet would probably be enough for it. It seems to me the most logical and least used sci-fi ship design is a sphere. It provides the ultimate use of interior space and creates the fewest number of “weak points” on the surface of the ship. This allows for more natural movements in space as well. Just look at ocean submersibles. They are most often spherical with various arms, etc, attached to the hull. This is to even out the exterior pressure on the ship. The same would be the effect for the internal pressure on spaceships. Also, easier to create a natural electro-magnetic shield in that shape and more effective for avoiding damage from glancing blasts. It’s also one of the leading designs for the spacecraft we send to Mars, Essentially a big inflatable sphere with a layer of water around the shell for protection from cosmic rays and solar radiation. The first spaceships in Perry Rhodan (German pulp series) actually were spheres. Later on they also had cigar-shaped once, if I still remember it right. Way back in the golden age of SF, John Campbell wrote a series where the characters built a spherical starship. Still a good idea if the ship is a small single pressure vessel (i have fighters called “murder balls” with a large tail wing / radiator. Anything biger and you want less surface area smashing into asteroids. Thanks for reminding me of the murder balls. Yeah it’s a great way to build tension. Battlestar Galactica did a good job with it too.